Comfortable and spacious apartment set 1 min walk from Castel S. Angelo, few minutes walk to reach The Vatican, Piazza Navona, near transports that will allow you to reach the other parts of the city, near shops and restaurants. Central heating, cot, washing machine, dishwasher, microwave, TV, dvd player, ipod station, hair dryer, internet WiFi, elevator. 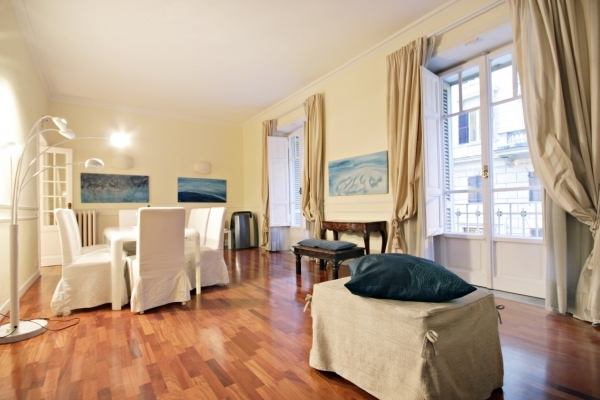 This appartment is a true taste of the beauty and luxury the Eternal City is famous for. Hardwood floors, elegant chandeliers and sophisticated furniture, the tastefully decorated flat offers a fully equipped kitchen, a large sitting/dinning room with 2 lovely French balconies which are also present in the master bedroom and in one of the other bedrooms with 2 single beds. All 3 bedrooms have en-suite bathrooms, 2 of them have showers and the master bedroom has a bathtub. It is located in the area surrounding the famous Piazza Cavour, dedicated to one of the founding fathers of united Italy, Count Cavour. The area is very well served by buses as this square is one of the major hubs of the city. Nonetheless, it can also be an ideal starting point for enchanting strolls as it is close to landmarks such as Castel Sant’Angelo and St. Peter’s, along with the sophisticated and lively shopping lane Cola di Rienzo. On a relaxing night in, while not exploring the city, the apartment provides a flat-screen TV and a docking station, ideal to add a personal touch to the soundtrack of your Roman adventure! From Fiumicino airport: take the train that brings to Trastevere station (8€) and then the bus nuber 780 (Piazza Venezia direction) until "Largo di Torre Argentina". Take the bus nuber 30 till "Piazza Cavour" and continue on foot for 4 minutes. From Termini station: take the metro A line ("Battistini" direction) and get off at "Lepanto" stop. Continue on foot for 6 minutes. The Overnight Rome City Tax (€ 3,50 per person per night with the exception of children up to 10 yrs) is due cash upon arrival. This fee, (max 10 nights) is not included in the total rate. Every check-in performed after 20:30 is to be considered a late check-in and it is 35 euros cash to be paid directly to the greeter. Great location, awesome apartment, very very very spacious and comfortable, clean, elegant and bright, well-equipped kitchen, vicinity is safe, minutes to everywhere just by walking - overall best experience we've (we= me, my husband, my sister plus 3 unbridled kids) had with rentals online. Glad we had the opportunity to stay here :}}}} We hope to return soon! What a beautiful apartment! We stayed here with family and friends and had great time. The place is very elegant, comfortable and in a excellent location. The host made our stay very pleasant , we will definitely recommend it. We are looking forward to our next trip to Rome.